Over the weekend, “The State of Lagos Housing Market Report - Volume 2” was launched by the Roland Igbinoba Real Foundation for Housing and Urban Development, RIRFHUD amidst all relevant industry stakeholders. 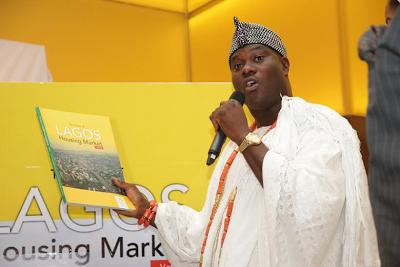 (Photo above - Ooni of Ife holding the report). 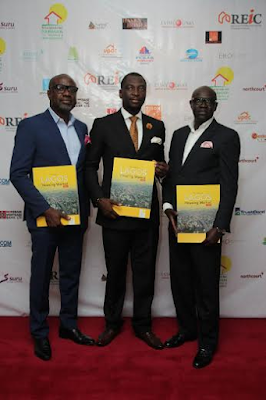 The report, which was formally presented to the public at an event held at the Grand Ballroom, Eko Hotel and Suites, Victoria Island, Lagos outlines many indices in the residential real estate market in Lagos. For example, the report states that Lagos state housing deficit is 2.9million units, and that 71% of Lagosians default in their rents. Furthermore, as many as 66 percent of respondents surveyed across the length and breadth of the city-state, disclosed that they yet preferred traditional brick and mortar constructions to houses made with alternative building technologies. Entitled "The State of Lagos Housing Market Report, Vol 2", it is a sequel to the first edition that had been published and launched in 2009.Delivering his address as royal father of the Day, the Ooni of Ife, His Imperial Majesty, Adeyeye Enitan Ogunwusi Ojaja II, who is himself a notable player in the Lagos and Nigerian housing market called on stakeholders in the industry to cooperate more amongst themselves and with government to ensure that Nigeria moves from housing construction to housing manufacturing, affirming that this was the only way the present collosal housing deficit in the country which is put at about 20million can be reversed. 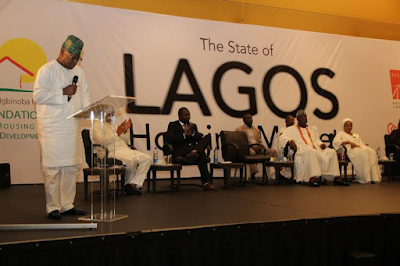 On his part, Lagos Governor, Mr. Akinwunmi Ambode, represented by the State Commissioner for Housing, Honorable Gbolahan Lawal disclosed that the state had presently commenced a rent-to-occupy scheme to enable more of the teeming numbers of its population be able to access and afford houses of their own.Later in the event, the Ooni of Ife and the Executive Governor (represented by Honorable Gbolahan Lawal) unveiled the report. Speaking on how the report will impact the economy, Newton Jibunoh, chairman of the foundation noted that through the publication of the book, they have given support to a fledgling sector of the economy, thereby contributing to the process of effecting a small change. 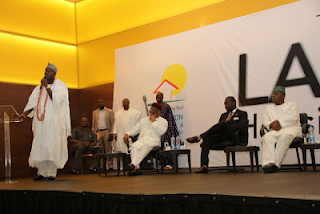 “Interestingly, what we found out is that people are moving away from the 1000sqm and 1,500sqm of houses to some three bedrooms four bedrooms luxury fully serviced apartment. You see people moving from the Ikoyi/Banana Island areas to do some off plan projects for luxury development. 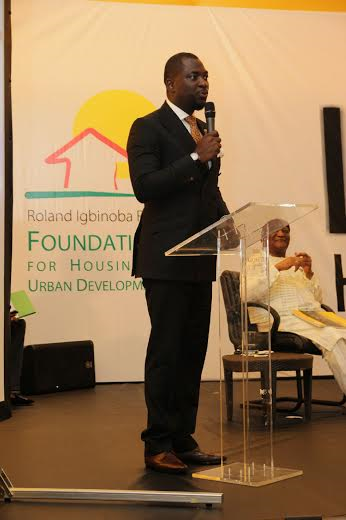 Mr. Roland Igbinoba, Executive Vice Chairman,(RIRFHUD) making a speech at the event. From left to right, Mr. Gbenga Olaniyan - MD/CEO, Estate Links International, Mr Roland Igbinoba, Executive Vice Chairman, (RIRFHUD) and Mr. Mustapha Njie - MD/CEO TAF Africa Homes, Nigeria/Gambia.